This shoot is to help youth learn archery techniques and to have fun. 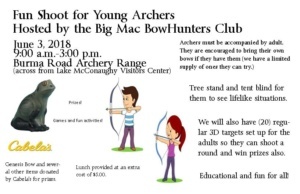 We will have a tree stand set up, tent blind, and a bow fishing simulation so youth can learn real life hunting techniques. We will also have games and prizes. Cabelas has donated a Bow and other items to giveaway. Adults can shoot a regular round of 20 targets. There will be games and prizes for them too.